Father Ray's 'Other' Corner: How Do You Define ‘Greatness’? How Do You Define ‘Greatness’? The question I’m referring to is: How do you define ‘greatness’? Well, from one perspective, that’s true—those other issues do have a certain priority. But from another perspective your ideas about greatness are just as important, because those ideas have a direct influence on how you see yourself and on how you look at life—life here on this earth and life in the hereafter. And the other ten were clearly no different from James and John, because the passage tells us that when they heard about this request they “became indignant” at their fellow apostles. They became indignant because they wanted those seats for themselves! Jesus then shares his understanding of ‘greatness’ with these twelve men, telling them, in effect, that in God’s eyes (which are the only eyes that will matter on Judgment Day!) greatness is measured by how selflessly, and sincerely, and completely you serve the Lord and your neighbor, and that the ultimate act of service—and hence the ultimate act of greatness!—is to give your life for another human person. Obviously most of the world sees greatness the way James and John saw it: in terms of prestige, power and authority. And this is demonstrated every day by the priorities people set and by the things they actively pursue in their lives. This, incidentally, is why God and the things of God—like attendance at Sunday Mass—take second place very often to worldly pursuits, like sports. How many parents rarely take their children to Mass, but would never allow them to miss one of their athletic events or practices? For those parents, greatness comes with being a famous and talented athlete, not a selfless servant of God and neighbor. This illustrates the point I made a few minutes ago: How you define greatness has a direct influence on how you see yourself and how you look at your own life—and at the lives of your children. 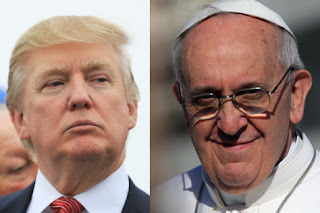 In preparing this homily, I tried to think of two people who exemplify these two very different understandings of greatness, and the two individuals who came to mind almost immediately were Donald Trump and Pope Francis. · His primary description of himself is that he’s a sinner. · His constant request is that people pray for him. · He goes from place to place in a Fiat. · He insists on paying his own hotel bills. · He lives in a humble residence. · He has no problem kissing the feet of prisoners and those on the fringes of society. · He’d rather eat with homeless people than with the rich and powerful. In all likelihood, not too many will. Then describe Donald Trump to them (again, without revealing his name) and see what kind of response you get. I guarantee you that, if they are being honest, most will be much more willing to call Trump “great”—even if they would never, ever vote for him in an election. Donald Trump is successful—extremely successful!—but in and of itself that doesn’t make him great (in the true and Christian sense of the term). Pope Francis, on the other hand, is great by Christian standards, but highly unsuccessful by the standards of people like Donald Trump. Some people in this life are successful; some people in this life are great; and some are successful AND great! Yes, it is possible to be both—one does not automatically exclude the other. It’s not easy to be both, for sure, though it is possible. But if you are forced in your life to choose one or the other, then choose to be great!—just make sure you embrace the right definition of greatness. And if you’re wondering what that definition is, look to Pope Francis, not to Donald Trump.